Great Uncle Sneezer has gone on a world wide wizard walk, and has somewhat unwisely told his nephew Freddy to look after his house. This he does with the help of his dragon, Odds. And if it were not for Odds’ often timely help, things would get even more chaotic than they usually are. 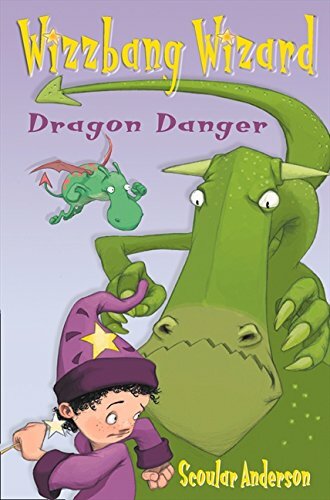 In Freddy’s first adventure, he has to find Odds who has gone temporarily missing – and once that problem is solved, to protect matters against the evil dragon Ormudd. ‘Do not look out of your window or leave your bedroom’ warns Odds. Of course Freddy does... and of course everything turns out well in the end. In Freddy’s second adventure, Jakaranda and he team up to destroy the wand of Wikslug, getting it out of the hands of the evil Wizard Beetleboot. And in both adventures, chaos rules supreme. Such delights as grasshopper glue and a flying birthday cake only add to the general slapstick humour of the stories which will greatly amuse young readers. There are plentiful black and white illustrations that add to the fun and the text is generously spaced for newly confident readers.